This alternating pressure overlay system is ideal for the prevention treatment of bedsores. This overlay air mattress incorporates alternating pressure therapy with low air loss. This alternating pressure mattress overlay is a cost effective and is often used as an upgrade for patients who are looking for a system more comfortable than the alternating pressure pads. This model has 17 alternating pressure cells for pressure relief and comfort. 9 of the alternating cells use a low air loss feature. Low air loss therapy is designed to assist in keeping the patient cool and comfortable. The air pump is whisper quiet and produces 8 Liters per minute of constant air flow. This is double the air output of standard alternating pressure pad overlays. This alternating pressure overlay can be used over a twin sized mattress or medical bed frame. 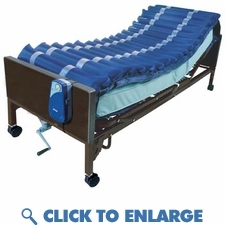 This medical mattress system can be placed over a standard gel overlay mattress to offer the patient additional healing and bed sore prevention. This alternating pressure overlay system is ideal for the prevention treatment of bedsores. This overlay air mattress incorporates alternating pressure therapy with low air loss. This alternating pressure mattress overlay is a cost effective and is often used as an upgrade for patients who are looking for a system more comfortable than the alternating pressure pads. This model has 17 alternating pressure cells for pressure relief and comfort. 9 of the alternating cells use a low air loss feature. Low air loss therapy is designed to assist in keeping the patient cool and comfortable. The air pump is whisper quiet and produces 8 Liters per minute of constant air flow. This is double the air output of standard alternating pressure pad overlays. This alternating pressure overlay can be used over a twin sized mattress or medical bed frame. This medical mattress system can be placed over a standard gel overlay mattress to offer the patient additional healing and bed sore prevention. This medical air mattress is designed to be used in the prevention, treatment and management of pressure ulcers. 8-LPM (Liters per Minute) newly designed pump produces consistent air flow. Pump has LED indicators to identify normal/low pressure levels. 17-Air cell configuration, 9 with laser holes to achieve low air loss function, to increase patient comfort, keep the patient cool and speed recovery. 3-Air cells at head section remain static, enhancing pillow function. Spring lined air tube prevents kinks and disruption in air flow. 5-Inch cells are constructed from Nylon/50% TPU material that is durable. The Nylon/TPU cover material is water resistant, vapor permeable and machine washable. The cover is secured to the mattress with straps. Power Cord Length: 14.76 Ft. Maximum Support Capacity: 300 lbs. OPTIFOAM AG SILVER WOUND DRESSING 4X4"